Rules let you handle email messages automatically based on a variety of different criteria. For example, you can move all messages from someone into a folder, or immediately delete all messages from a pesky online shopping site. Sometimes, you might set up several rules that could apply to a single message. 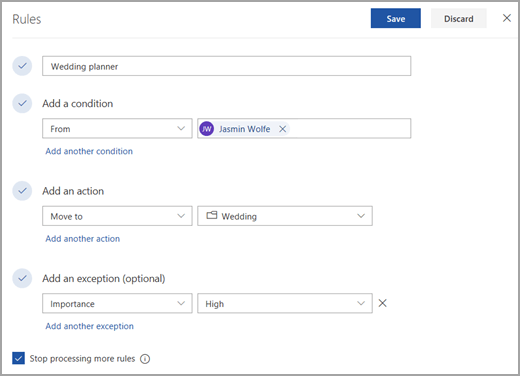 If you created a rule to move all messages with a subject line of "Wedding plans" to a folder, for example, and then created another rule to delete all messages with attachments, you probably wouldn't want a message related to wedding plans that has an attachment to be deleted. To prevent this from happening, you can set the option Stop processing more rules on the first rule. Subsequent rules will be ignored, even if they apply to the message. In this example, the Wedding planner rule moves any email message from Jasmin Wolfe to the Wedding folder except if the message is marked Importance High. Stop processing more rules is selected, so no additional processing will occur. Select Edit next to the rule to which you want to apply Stop processing more rules. Select the check box for Stop processing more rules.